Hat-tip to my friend Georgia who wrote in with the note, “I found you in the form of a Danish shop! WEIRD <3" I had never heard of them and did a quick search - found them as one of the retail chains for Bestseller, a Danish 'family-owned clothing and accessories company' since 1975. They had an entry for Normal but it's since gone dark - you can still find it here on the Wayback Machine, also printed below. They also had a PDF (in Danish) which I’ve archived here. THROUGH AN INVESTMENT COMPANY, BESTSELLER-OWNER ANDERS HOLCH POVLSEN HAS BOUGHT 25% OF DANISH GROCERY RETAILER ‘NORMAL’. ‘Normal’ is a Danish retail store specialising in parallel importing branded goods from other EU countries, where the goods are often times sold at a lower price than in Denmark. The goods cover a range of categories like personal hygiene products, household products, cosmetics, pet food, health food and beverages. 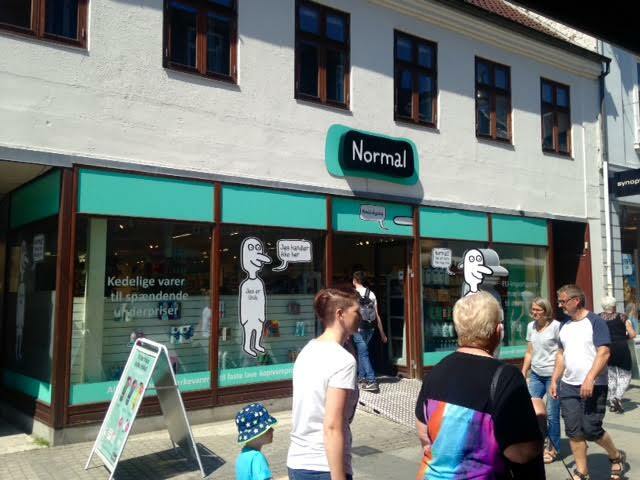 ‘Normal’ was established in 2013 and has six stores in Denmark, with expansion plans forecasting one new store each month. “‘Normal’ as an interesting and innovative take on selling branded products. The concept is promising and holds great potential for further development, and behind the business are some dedicated people eager to build a new business,” says Anders Holch Povlsen about the investment. Strangely, all that ‘interest’ in ‘investment’ has disappeared from the parent company’s website – that’s kapital for ya!